Summer is coming to a close, and if you are like me you are looking at the expiration dates on the sunblock and lotions to decide to keep them or not. I had a less then half bottle of Aloe Vera Gel sitting under my bathroom sink. What to do? 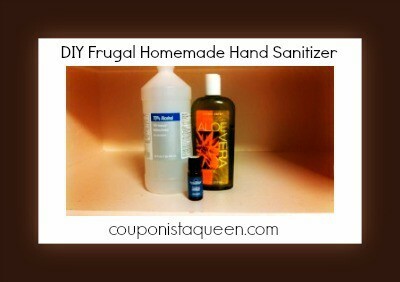 Well I decided to figure out a frugal way to use it and what I found was awesome! 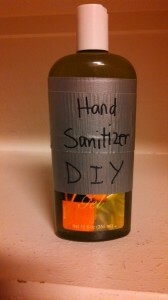 There are plenty of ways to make your own Hand Sanitizer. So I picked a Frugal one and ran with it (not really more like a light jog, I don’t run☺). OK so what will you need? Mix in a bowl until well blended, fill container of your choice. Really stop staring, you are making me nervous. You will need to adjust the essential oil to your liking, at least 8 drops but I did more like 12. If you want to buy some cheap Aloe Vera gel, I’ve seen it at the Dollar Tree. Each tube has 6oz so you’d make two batches from one tube for $1. You’d be out $2 for the supplies if you don’t have the alcohol. I did have it on hand which was the purpose of my experiment, to re-purpose leftovers. Some people go green and make this with Vodka and distilled water but I didn’t want my hubby to think I was making a cocktail. I refilled the Aloe Vera Gel bottle and slapped some duct tape on there to label it. 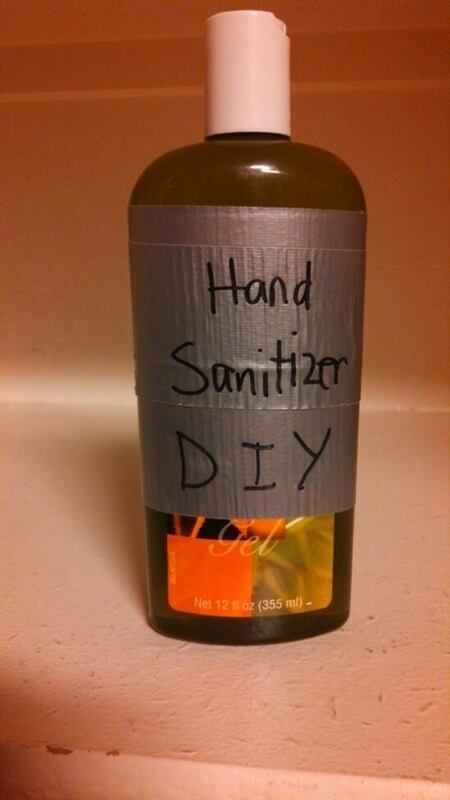 I rubbed some on my hand, it is watery and you don’t need much. Just splash a little on and rub until gone. When you do this it smells like alcohol but once it dries I had a great lavender scent on my hands that even the hubby liked. How much did it make? Well, it refilled my 12 oz bottle from the Aloe Vera Gel and I had about 4-5 oz left to put in a small bottle for my purse, so you are looking at making about 18 oz more or less. Again, the frugality comes in the fact we are using what we might throw away at the end of Summer not actually making it to replace something we already buy. 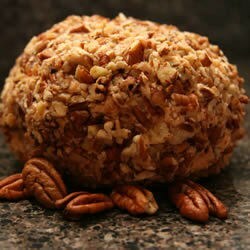 Now I’m off to re-purpose my leftover roasted chicken to chicken salad for tomorrows lunch!